Miracle alert! I’m showing signs of early labour so headed to the shops for snacks. Thought I should buy a paper as a souvenir if Forrest turns up. Realised I was in today’s Sunday Mail! I spoke to the journalist (she’s a Master 33 lifepath) about orthorexia a while back but wasn’t sure when the story would run. They left out the trigger for my illness (grief over a breakup on 11/11/11) which is a shame as it wasn’t just because I studied nutrition. Plus my weight loss was a bit less than reported, and two friends helped me (Natalie Fitzpatrick, my acupuncturist and counselling mentor Caroline Byrd) not just one. But overall the article’s accurate. I’ve noticed many sensitive/ psychic/ Starseed types have eating issues, especially in their teens (age 14-15 seems to be a turning point). I see this as the tipping point when the ‘anaesthetic wears off’ and we realise we have chosen a human body on a really complex planet! I personally stopped eating because my Dad had left home, I was absorbing so much energy and didn’t know how to cleanse my aura or ask for help with spooky stuff like feeling Spirit. Keeping secrets makes you dark inside. I lost my appetite for life because I was surrounded by so much fear. It was only when I surrounded myself with loving people and causes that I developed the will to get up again. Read more on surviving bullying. I hope this article brings hope to people who are struggling. I literally had to crash my car and go to a doctor for a suspected heart attack before I got help. Thank goodness for my GP Dr Leanne Barron, counsellor Alison Lee and the team at Isis – The Eating Issues Centre Brisbane (links are below). If I can come back from the edge, anyone can!! It just takes love…Kris (my fiance) has been my rock 🙂 SO many people I know with eating issues are simply leaders who are afraid to grow up, due to a lack of positive role models. Once they let go of the need to control, everything blooms really quickly. My life is proof of this. P.S. 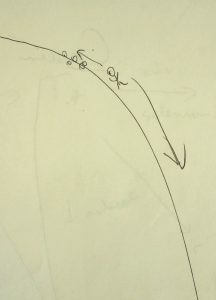 This was the picture that changed my life: Dr Baron drew it for me to explain what I was doing to my heart and my health. She said I looked relatively ok, but my internal organs could simply shut down if I kept depriving myself of nutrition. Similar to going down a waterfall or white water rapids. As soon as I saw this diagram, I knew I had to pull myself back from the edge. Isis – The Eating Issues Centre – their group therapy course helped me immensely in 2015. I love their work! How uncanny that they are at an 11 address (read more on address numerology). 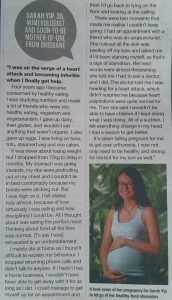 Heartwork – Alison Lee was my counsellor while I recovered from Anorexia/ Orthorexia. She’s a Master 11 lifepath like me. What a coincidence! I only figured this out after seeing 11:11 around her. Doctor Leanne Barron from Brisbane City Doctors – is the gifted GP mentioned in the article who woke me up and helped me heal. Interestingly, her name adds to Master 11 as well – the Spiritual Messenger number. Finding Spiritual Relief from Anorexia – A Metaphysical View The full story of my journey from denial to extreme self-care. -Join my facebook pages The Numbers Queen and Lifepath 11. You’re welcome to post questions on the timelines, however I don’t offer free advice, only paid readings. I’m also on Instagram @ SarahYip1111. 8 Spiritual Lessons from the Movie ‘Moana’ – When the Coconuts Go Black, It’s Time to Get On Track! 11:11 Podcast with SisterFriend Marie – Why Sceptics See Repeating Numbers On Clocks!